I know, I know - podcasts aren't books. BUT, there are some amazing ways that podcasting is being used to tell stories, much like the old radio programs of yore. And I feel like following a story via listening is a bit different from watching it unfold on-screen. Listening to serial fiction podcasts isn't reading, but it's not watching tv either. I guess you could say they're closest to audiobooks :) Which I am totally in favor of, as a reader. I don't listen to a LOT of podcasts. Or, I should say, I don't subscribe to a lot of podcasts, since I'll listen to episodes of random podcasts because they have guests or topics I'm interested in for that particular episode. But there aren't many that I would stick around for. 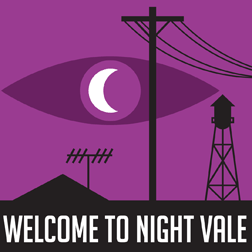 Welcome to Night Vale is one of them. In fact, it's the podcast I've been subscribed to the longest. It's a fictional series, about a mysterious desert town, where everything is... well, the quickest, simplest summation I can give is that it's basically a place where any conspiracy theory you can think of is true. (All at the same time, even.) But it's really not that simple. The podcast is presented as a classic radio program hosted by a man named Cecil, and he talks about town news, the community calendar, the traffic report... you know, normally mundane things, except that there is the Sheriff's Secret Police to contend with, mysterious hooded figures hanging out at the dog park, a glow cloud, and random appearances by The Faceless Old Woman Who Secretly Lives in Your Home. It's witty, hilarious, touching, and really, really weird. 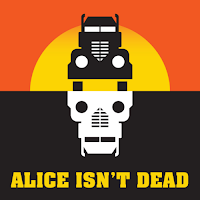 Anyway... Night Vale is extremely popular, and I've been a huge fan of it for years, and I'm giving this giant lengthy introduction as a lead-up to talking about Alice Isn't Dead, which is the second podcast series launched by the crew behind Night Vale. (There are currently four series being produced by Night Vale Presents.) Alice first began about a year ago, running ten episodes for its first season, and I'm just now getting around to it because season 2 is about to start, and I wanted to catch up. I'm only a few episodes in, and so far, it is amazing. I was expecting it to be similar to Night Vale, and while it too has its share of eerie figures and conspiracies, Alice is creepy where Night Vale is comical. It is narrated by a woman (voiced by Jasika Nicole) who has become a truck driver in search of her wife, whom she previously thought was dead. And as she drives from town to town to find Alice, she encounters strange happenings and people-who-might-not-be-quite-human. WHY it took me so long to finally listen to this is beyond me, because I am hooked right now. It's engrossing. It's scary. It's even a bit heart-breaking, as the narrator addresses the woman she loved and mourned directly through her recordings. And it's really well-written, which is no surprise, since Joseph Fink is one of the writers behind Night Vale. If you're looking for something different, either because you're between books or you want something in addition to what you're reading, I highly recommend including some serial fiction podcasts in your literary life. And Night Vale and Alice are two great places to start. And if you've got some favorites you're already listening to, please drop some suggestions in the comments!